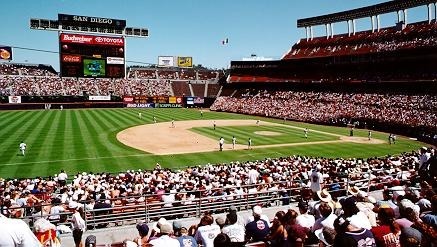 At one time, it was hard to tell that Jack Murphy Stadium was a multipurpose stadium, but after an expansion in 1997, that changed. 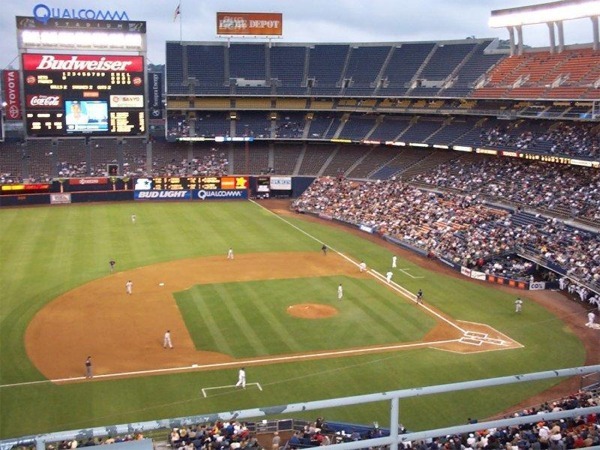 After years of having minor league teams playing in San Diego, local sportswriter Jack Murphy began to build up support for a new stadium in the mid 1960’s. 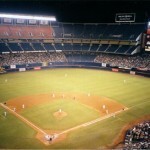 If built it would be the home to the San Diego Chargers (NFL) and an expansion baseball franchise. 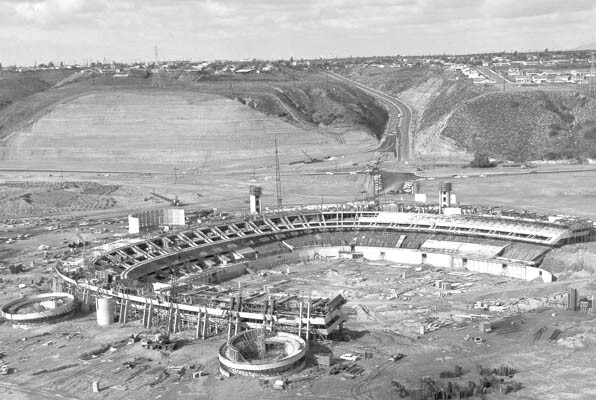 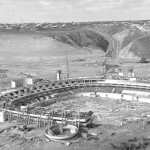 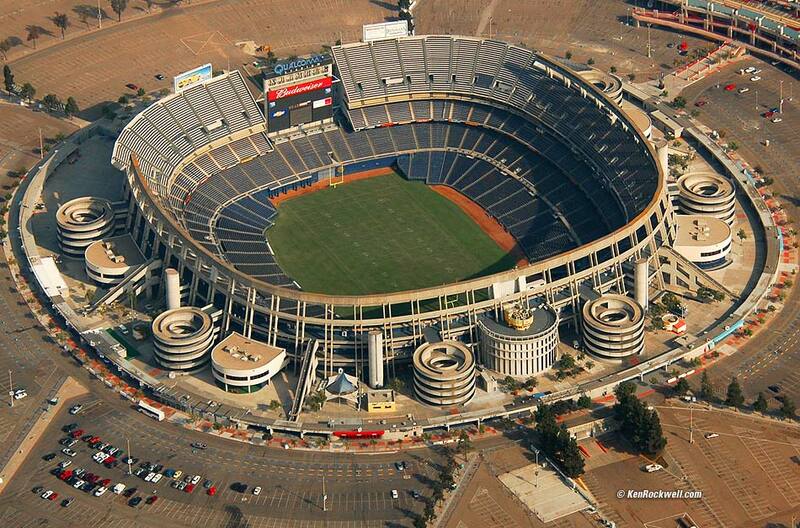 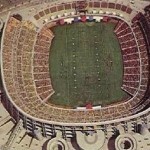 Located in Mission Valley outside San Diego, construction on the massive four tier stadium began in 1965. 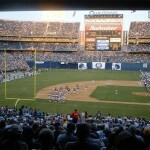 The first game was played on April 19, 1967 between the Chargers and the Detroit Lions. 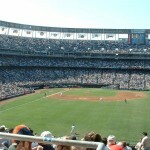 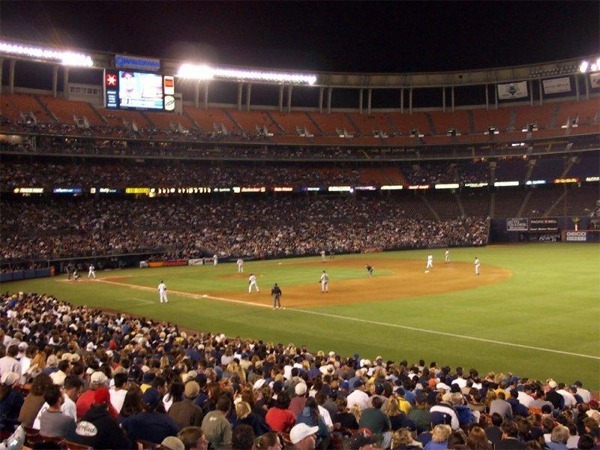 The Pacific Coast League’s Padres played at the stadium until 1969, when MLB awarded the area a professional franchise. 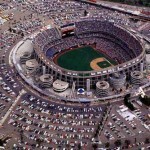 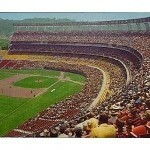 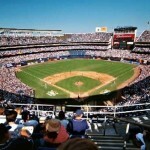 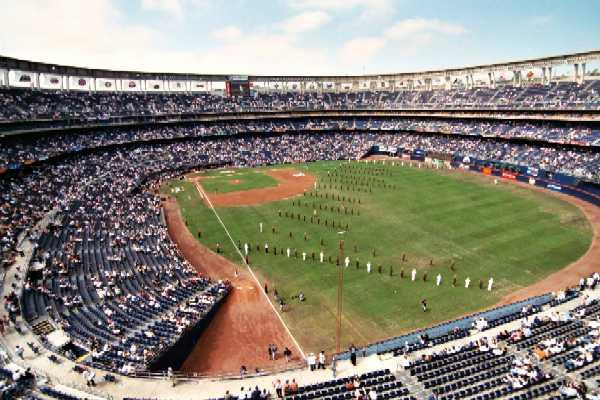 The expansion San Diego Padres began playing at the stadium on April 8, 1969. 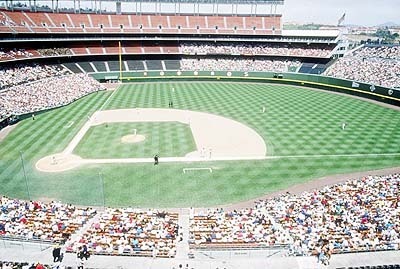 Only 23,370 people filled the 50,000 seat stadium on opening day. 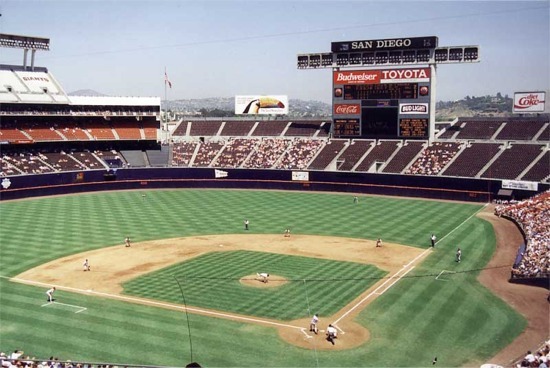 San Diego Stadium was the name of the ballpark until 1981 when it was renamed after the late Jack Murphy. 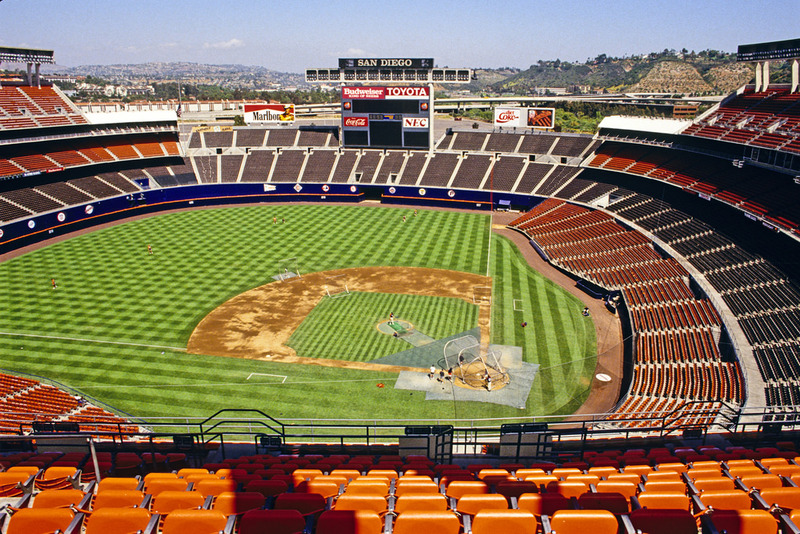 With its natural grass field and multicolored seats, “The Murph” as it was known, was one of the best looking stadiums in baseball. 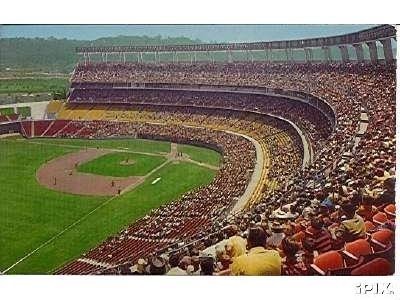 Open beyond the right and centerfield bleachers, views of hillsides could be seen until the stadium was expanded. 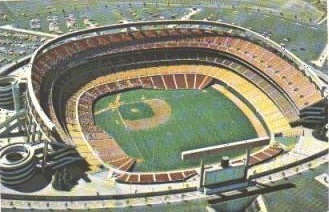 The seating capacity changed many times throughout the years. 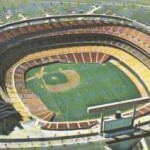 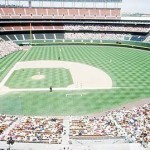 The right-field bleachers were expanded after the 1983 season, enclosing the field fully for the first time and bringing the capacity up to 59,022. 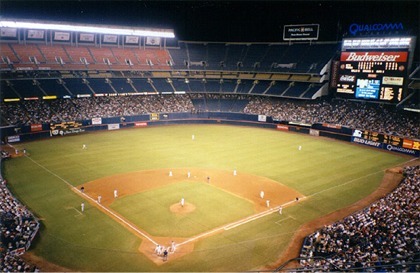 The most substantial change came when in 1997 when over 10,000 seats were added in behind the outfield for the Super Bowl, bringing the capacity to 67,544. 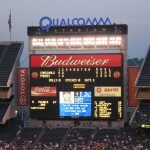 The scoreboard has remained it the same place behind the right-center field seats since the stadium opened. 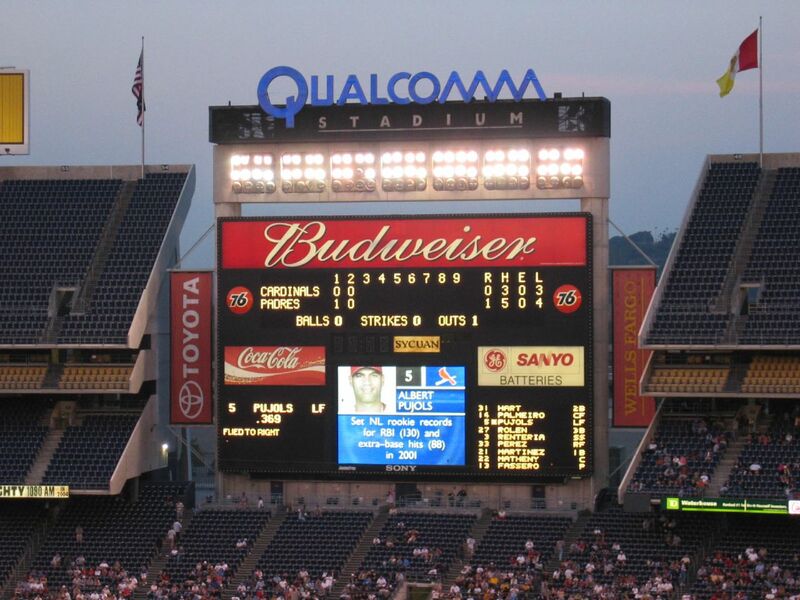 Jack Murphy Stadium was renamed to Qualcomm Stadium in 1997. 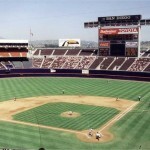 Today, Qualcomm Stadium looks more like a football stadium than a baseball stadium. 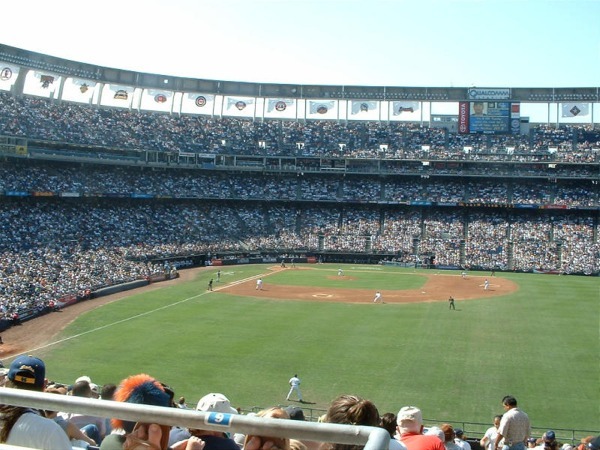 The bullpens are located down both the first and third base lines, and palm trees are beyond the outfield fence. 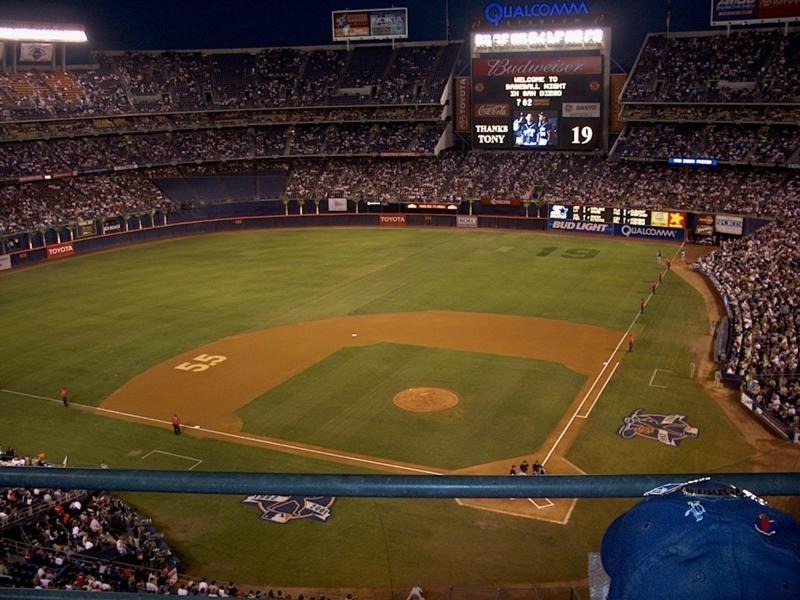 By the mid to late 1990’s, like every other team in MLB, the Padres wanted a new ballpark. 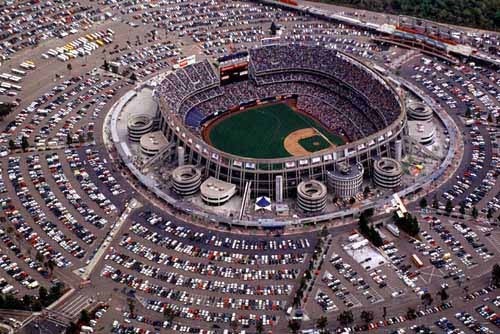 A new ballpark for the team, Petco Park was built in downtown San Diego. 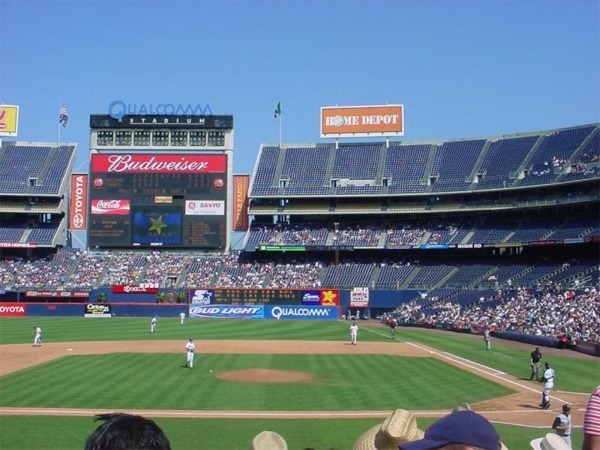 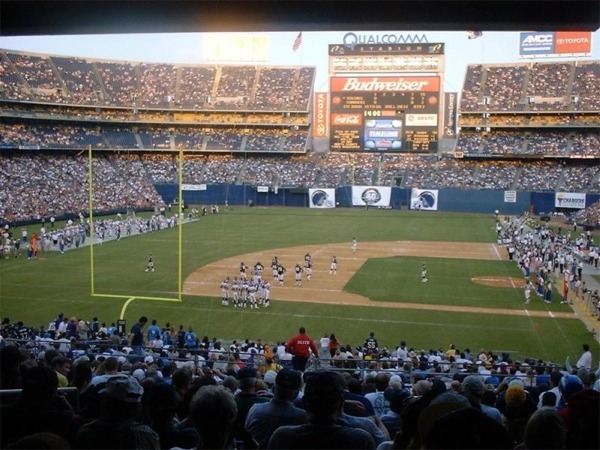 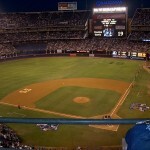 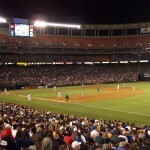 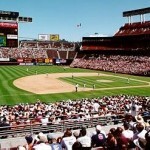 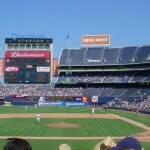 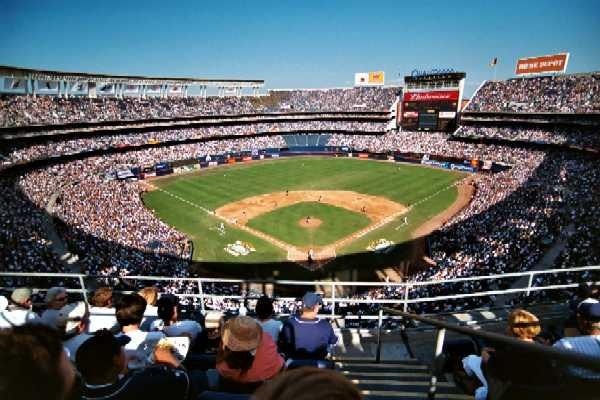 The Padres played their last game at Qualcomm Stadium on September 28, 2003. 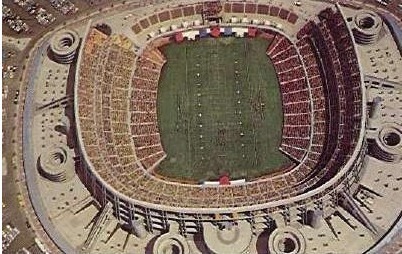 The stadium was the home of the Charges until 2017 when they moved to Los Angeles. 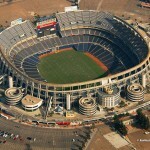 It continues to be the home of the San Diego Aztecs (NCAA) and several collegiate bowl games. 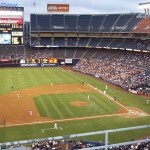 In September 2017 the stadium was renamed SDCCU Stadium after San Diego County Credit Union bought the naming rights to the stadium for $500,000 through the end of 2018.